Chinese Air Force (PLAAF) WZ-10 Attack Helicopter crash in a farm. A military helicopter crashed in a farm in Northwest China's Shaanxi Province on Tuesday afternoon, and the two pilots have been sent to a nearby hospital, local authorities said on Tuesday. The helicopter, a WZ-10, fell on farmland in Gushi town in Weinan around 2 pm. At 2:36 pm, the Weinan branch under the general team of the Shaanxi provincial public security firefighters received the call for help and sent about 10 firefighters to the scene, an official surnamed Wang from the branch's publicity department told the Global Times on Tuesday. "When our fighters came to the scene, the two pilots had been saved by local residents and were sent to a nearby hospital," Wang said, adding that she did not have further details. Some witnesses said the helicopter lost control and hit the farm after a loud sound was heard from its tail. The pilots suffered slight injuries which were not life-threatening. The cause of the accident was still under investigation, news portal sina.com reported Tuesday. 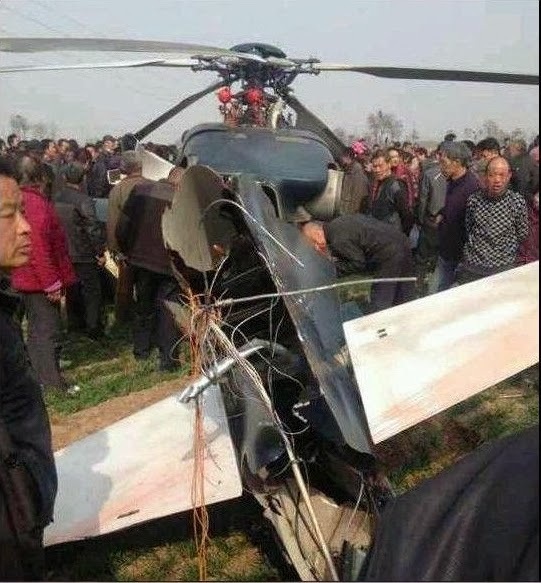 Judging from the pictures of the scene, most of the helicopter's fuselage remains intact and there was no fire in the body, sina.com reported, speculating that there was something wrong with the tail. The news portal deduced that the pilots had conducted an emergency landing, and its special design helped ensure the survival of the crew members, sina.com said. Designed by the Jiangxi-based Changhe Aircraft Industries Group and AVIC Harbin Aircraft Industry Group, the WZ-10 is a medium-sized helicopter of the People's Liberation Army and has a net weight of 5,543 kilograms. Its main task is to kill forces on enemy ground and related mobile forces.